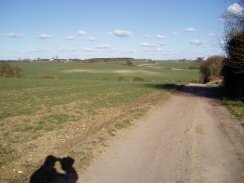 I walked the 10th, 11th and 12th links of the Hertfordshire Chain Walk on 5th March 2006. 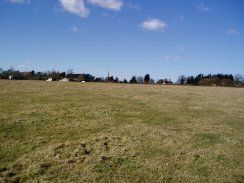 I parked in the village of Haultwick by the green at the end of Gifford's Lane and set out to link up with the top end of the 9th link that I had walked the previous week. 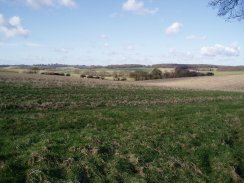 The further North the Hertfordshire Chain Walk goes the more rural the landscape becomes and there was hardly any road walking to be done on all of these three stages which made a pleasant change to when I think back to some of the earlier stages. 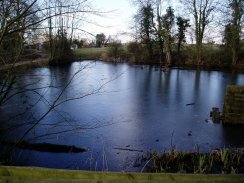 There had been a heavy frost overnight, as there had been for the last few nights, and although clear and bright it was a very cold day with a fairly strong wind blowing from the North. In many places the ground was actually frozen which was quite unsual, particularly as it is now March, however this did have the benefit of making some of the more muddy sections much easier to walk over. Later on in the day it warmed up slightly and much of the ground got a bit boggier. There had been some small snow showers overnight and in places where the sun had not reached this remained on the ground. From Haultwick the path goes down a gravel driveway between houses and into fields were a path makes its way around the edges of a number of fields to some houses and a lane at Green End. Almost immeadialty there were good views to be had across the countryside, photo 1. 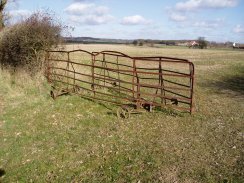 While crossing the fields I came across the pair of old wheeled gates in photo 2, rusted and rather bent and looking as if they have had a long history. I can't imagine anything similar being made nowadays. Just before I reached Green End I passed a group of Fieldfare in the field. At a minor road junction the route of the Hertfordshire Chain Walk turns left and then right along another minor road, opposite what is marked as a hotel on the OS map. 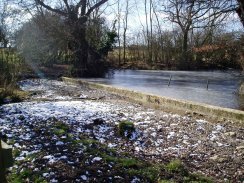 This is followed for a short distance, passing the ice covered pond in photo 3, before the road turns round to the left and the path continues ahead along an earth track, photo 4. A short while later the track forks and the path takes the right hand fork along a narrower track that starts heading downhill through Graves Wood to link up with the top end of the 9th link of the chain walk. 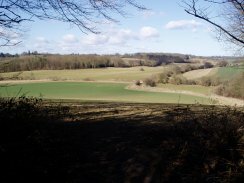 As the path decends down through Graves Wood there is a good view across the floor of the valley and along the route the Hertfordshire Chain walk is going to take, photo 5. Once in the valley the path crosses the two fields where the route is shared with the 9th link, photo 6. At the end of the second field the path turns right to continue along the footpath that I had headed down from Hebing End the week before. 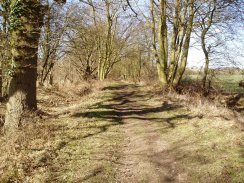 The path then starts climbing gently uphill on the right hand side of a field, photo 7, before entering a narrow strip of woodland that runs between the fields, marked on the map as Witnesses Wood. 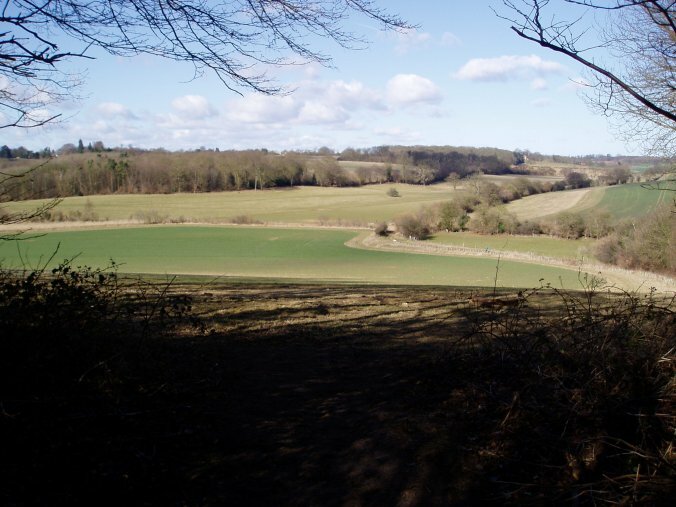 The path passes through a thicker band of woodland at the top end of the fields on an indistinct track and comes out onto a broader path besides a hedge. This leads to a farm track at the end of a field, photo 8 where the path turns left, then right a short while later following the track. At the end of the next field the path reaches the link between the 10th and 11th stages of the walk. I turned right here and headed gently downhill on a good track, photo 9, which is followed for some distance in an Easterly direction. 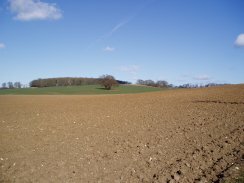 This was quite a remote area (for Hertfordshire anyway) and it is quite hard to give locations for the photos. After a right turn and a left turn and a slightly steeper section of the track a hedge is reached and the track turns to the right. If I had been walking just one link of the chain walk I would have followed the track to the right as it begins its way back to Haultwick, I however turned left following the hedge and dry ditch along the side of a field. The path turns left again to follow the field edge before turning right over a small bridge by Thrift Wood. The path climbs gently uphill again besides the wood, passing through one field and then another. 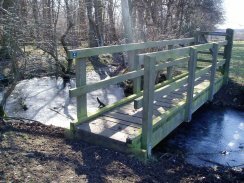 At the top of the second field the path goes through a gate and over another small bridge over, at this time, a very icy pond, photo 10. From the small pond the path heads in a Northwesterly direction besides a hedge before cutting the cross the corner of a field which was full of sheep and through a gate into another field by some farm buildings. The path skirts a barn and then turns right through a big farm gate (which I couldn't open and had to climb over) between more farm buildings. In one of the barns there were a number of sheep with thier new born lambs which reminded me very much of the farm close to where my parents live in Cornwall. Passing a pond the path turns left onto the road at Wood End. Ignoring a road the heads off to the right the path takes a footpath a short distance further on off to the right besides a Cattery and Kennels and for a short distance I was accompanied by the barking of numerous dogs. 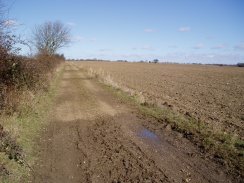 The path heads across a field, photo 11, in a North Easterly direction up to a road. As I was crossing the field a hare ran from my right, across in front of me and off through the hedge into the next field. This was only the second time I had been out walking and seen a hare at close quarters. If it had not bolted I would have probably never noticed it. 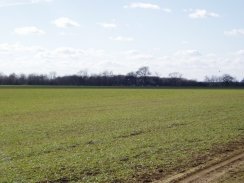 The first time I had seen a hare was in a field besides the M11 on the Essex Way. Maybe because of the noise coming from the traffic and the direction of the wind I was able to get very close up to it without it noticing me at all. I spent some minutes leaning on a gate watching it and it was only when I went to continue on my way that it finally spotted me and shot off. 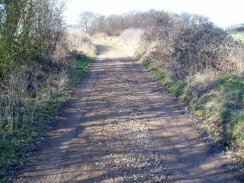 Anyway back to the Hertfordshire Chain Walk, the path turns left along the road for a very short distance before taking another footpath off to the right, photo 12. 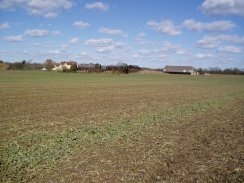 The path heads around the side of a field, passing a house, in a North Easterly direction, by my reckoning some distance to the right of the path that is marked on the OS map which I think is marked as going directly across the field. 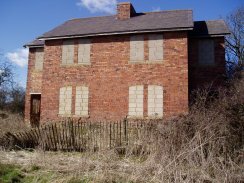 The path passes into another field and turns left to follow another field edge which then turns down to the right, past a very strange bricked up house, photo 13. This house is situated in the middle of nowhere and was a very strange sight. It would be fascinating to know the history behind it and how it came to be in its current state. 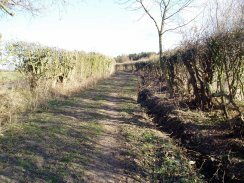 Beside the house the path passes through a gateway and goes down hill through a narrow patch of scrubland to a small pond, photo 14. From the pond the path goes through a gate and onto a track and into a field where the path follows the right hand hedge up to Back Lane, a track marked as a Roman Road on the Ordnance survey map, photo 15. 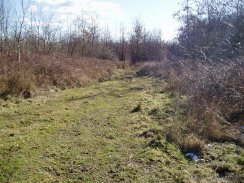 This is followed for a short distance in a North Westerly direction to where teh path links up withthe bottom end of the 12th link of the Hertfordshire Chain Walk which joins Back Lane from the right. A very short distance further on over small bridge the walk takes a footpath to the left over a stile and across a field in a Westerly direction towards the edge of Great Wood, passing a kissing gate that has become stranded in the field with no fence on either side anymore, photo 16. Skirting Great Wood the path passes into another field before going along a rather gloomy stretch of track between gardens to Moor Green where the route of the walk once again splits up with one branch heading in a South Westerly direction and the other path which I took heading up a driveway that turns left besides a converted barn and into a field where a track is followed round to the right until a newly installed metal kissing gate on the left takes the path in a Northerly direction across a field. 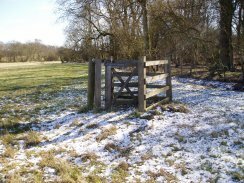 The path crosses over a small stile into another field, passes between two ponds and heads back up to Back Lane which once again is followed for a short distance in a North westerly direction up to a footpath on the right which leads past Drinkwater Wood. At the end of the Wood the path passes into a field and heads diagonally across it towards the buildings at Cottered Warren, photo 17. The path heads for the lighter coloured peice of ground to the left of the barn and there was no proper path across the field which was extremly muddy. By the time I reached Cottered Warren my feet were caked in mud which was to become a feature of much of the next few miles of walking. The path passes through a gate and between the houses at Cottered Warren, which mostly seem to be a group of converted farm buildings, and turns right onto a road for a short distance. 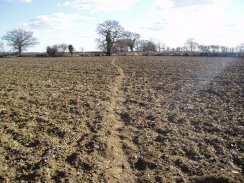 A footpath on the left leads down besides a very muddy field edge. 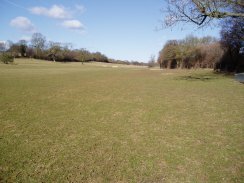 The path then begins to go uphill and enters an enclosed track that runs between the fields until a footpath to the right leads diagonally across three smaller fields towards the playing fields at Cottered although most of the village remained hidden just below the horizon, photo 18. The path passes alongside the playing fields to a minor road where it meets up with the 13th link of the chain walk which heads off up to the left however I turned right down the road towards Brook End to begin my walk back to Haultwick. I did not record the lengths of the individual links but I had walked 8.4 miles at this point. The path turns right where the road forks by a pretty thatched cottage surrounded by hedge, although it has been painted a rather too bright shade of pink for my taste, and the right along a path between houses and into a field. 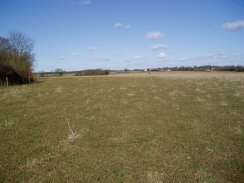 The path heads across this field and another field in the direction of Flanders Green where a wider track is joined. This curves to the left and passing a house becomes a tarmac road. A few yards ahead as the road turns right the route of the Hertfordshire Chain walk continues straight ahead along a footpath and into a field making for a wooded area in the distance. 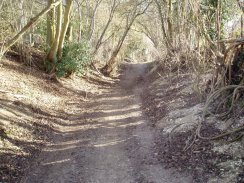 The path bisects the wooded area, photo 19, which seems to have been planted fairly recently and is not shown as woodland on the map. A small bridge at the far edge of the woods made a dry place to sit down and have my sandwiches. Sheltered from the wind by the trees and with the sun shining in my face it was a very pleasant place to stop. While eating my sandwiches I looked across the field to my right and could see a large herd of deer in the distance which seemed to be watching me. Although a long way off they can just be made out in the larger version of photo 20. (click the green text to see a larger version of the photo). Leaving the wood the path turns left and then right along a muddy track following the hedge at the side of the field in photo 21. 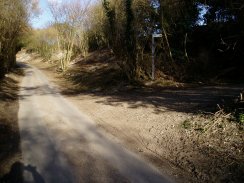 This track is followed all the way back to Back Lane once again, photo 22, where the 12th link of the Chain walk is completed. 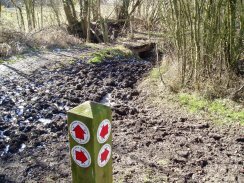 As the red markers on the post indicate this section of path is a byway open to all traffic as was much of the following stages back towards Wood End which meant they were often very muddy to walk along. 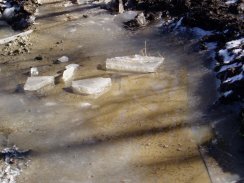 Photo 25, which was taken on Back Lane, close to photo 23, gives some indication how thick the ice was on the puddles and also how boggy some of the ground could be. Anyway from Back Lane I retraced my steps past Great Wood and the isolated kissing gate in photo 18 and back to Moor Green again. This time I turned left down a driveway, right along the road for a short distance and then left down a very muddy byway. There was a small sign at the start of the byway stating it was closed to traffic because it was in a dangerous state although the sign was undated and I could see evidence of the byway having been recently used by four wheeled vehicles. 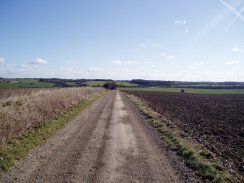 The byway led past Muncher's Green and at a fork in the route takes the right hand track. A short distance later the path turns left onto another byway, photo 24. 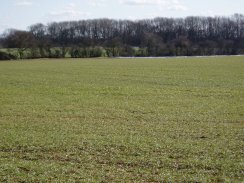 The surface of this was much drier and easier to walk along as it headed in a South Easterly direction towards Wood end. The path bears right when it reaches a groups of houses and heads due South past Parkers Green. Just before a house is reached at the end of the track the path bears left into a field, photo 25. The soil here was much drier than in the fields near Cottered Warren and fortunatly did not stick to my boots like earlier. From the field the path leads over a stile into another field, skirts round the edge of another field and then crosses a final field to rejoin the top end of the 10th link of the Chain Walk, close to where photo 11 had been taken earlier in the day which completes the 11th link. Photo 26 is taken a bit further down the track from photo 11. 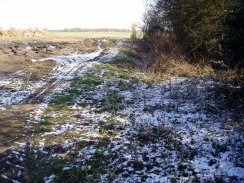 As mentioned earlier, the Hertfordshire Chain Walk heads down this track once again and after a right turn and a left turn and a slighlty steeper section of the track a hedge is reached and the track turns to the right. 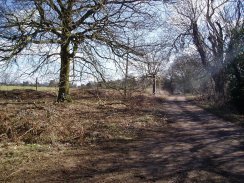 This time around rather than head left towards Thrift Wood I followed the track round to the right which after a short distance reaches a road. The path turns left on to the road which climbs gently uphill. Soon a byway named Dark Lane is reached leading off to the right which I went up, photo 27. After about five minutes walking along the track, photo 28, I realised that I had turned off the road too soon. 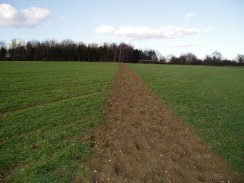 The track would have rejoined the route of the Hertfordshire Chain Walk and continued on to Haultwick however for the sake of completeness I dedcided to retrace my steps and continue up the road to the correct path. As I reached the road I encountered a group of five or six landrovers just about to go up the track for some off road driving. The real route of the path was a bridleway a short distance up the road. This led uphill between hedges, photo 29, before turning right onto a track just after an isolated barn and pond. As the track turns to the left at the end of some trees a footpath, photo 30, leads across a field and on down past a group of houses to rejoin the road in Haultwick from where it was just a short walk back to the car. 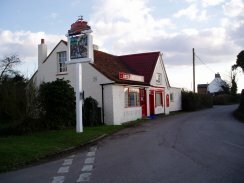 Close to where I had parked in Haultwick was the Rest And Welcome pub, photo 31, the front of which looked more like a village shop than I pub. Sadly it being the middle of the afternoon the pub appeared shut and I was unable to pop in for a quick drink which was a shame. The GPS made this walk 14.7 miles long.